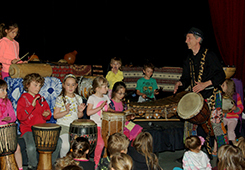 In this workshop, the participants discover musical instruments from around the world. It is also an invitation to visit the cultures of African peoples. 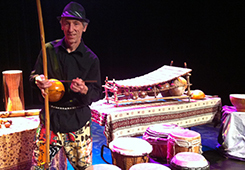 Experimenting with instruments from different peoples, such as the balafon, the djembe, the kalimba, and more than 20 instruments. Together they play and create musical pieces. Go to discovery of people and culture of the world. More than 20 musical instruments are show : Balafon, Djembé, Kalimba, musical bow, ... the concert is interactive, some spectators participates in playing one instrument with Daniel on stage and others, in making sound and beating the rhythm. There is a note of humor and the audience are part of a fantastic journey where they discover new cultures and expression of arts. 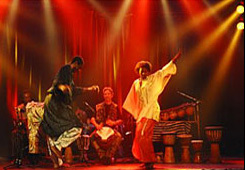 Performing concert, rhythms of Djembe and Balafon pieces, more than 15 instruments use in this special international event. This interactive concert invite the audience on a journey to the origins of the traditions of the west African peoples. The spectators participation on stage and on the hall are part of the concert.